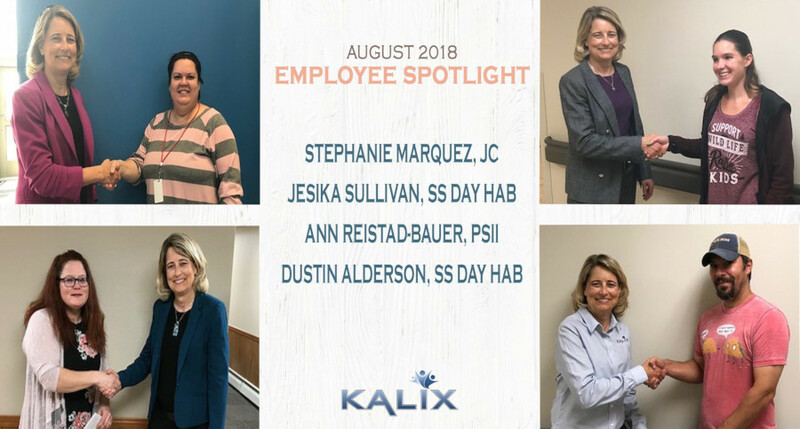 Congrats to the August Employee Spotlight recipients Stephanie Marquez, Ann Reistad-Bauer, Jesika Sullivan & Dustin Alderson! Stephanie successfully established a positive relationship with the military at the MAFB Fitness Center by being proactive and providing outstanding customer service. Fitness Center staff recently expressed their appreciation when Stephanie immediately took charge of cleaning up after an incident at the facility. When a program enrollee was recently diagnosed with a chronic medical condition, Ann assisted him and his staff to learn about and implement major changes to his diet at home. She also helps him plan what to order at a restaurant within his new diet. Ann’s non-bossy approach is successful where previous efforts have failed, resulting in successfully stabilizing a serious health situation. Jesika and Dustin alternate with providing 1:1 support to a person who doesn’t talk much. They have established close relationships and communication through eye contact, gestures, and words. That helps him to successfully manage frustration and have a positive day.